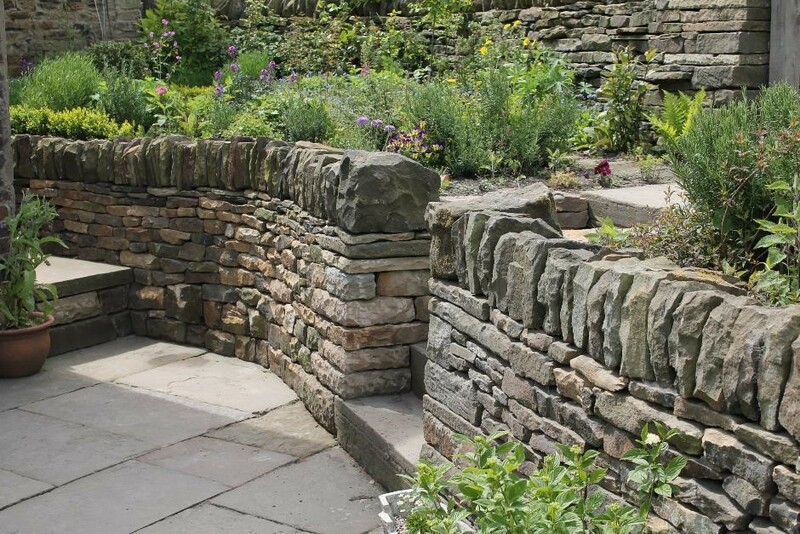 This garden has involved restoring some old walls but also redrawing new boundaries within the garden as a whole using raised terraced areas. We have undertaken this garden as a series of projects as the layout was two gardens separated by a track, a lower garden and a walled vegetable garden above the track. 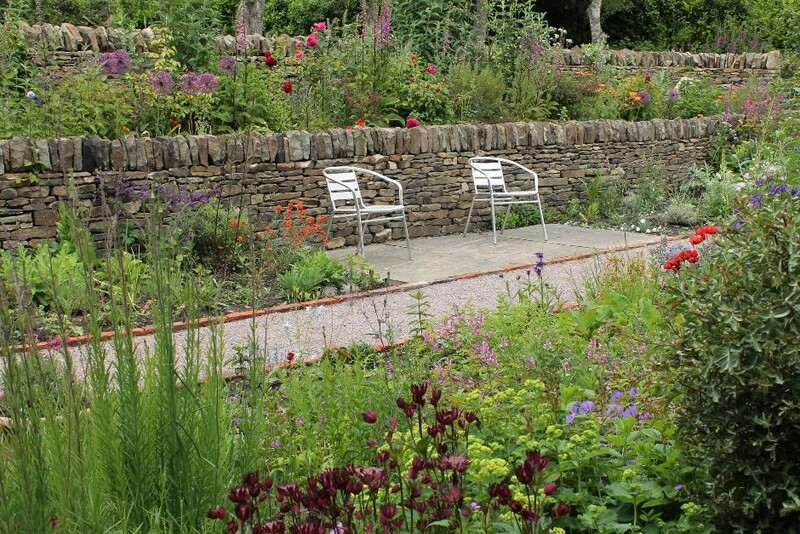 Originally, the lower cottage garden was very undefined, which we formalised with a stone walled terrace, patio and steps in order to create an ornamental flower garden with a path and seating area. The top vegetable garden was to become a formal herb and vegetable garden with tall walls creating a sheltered area and a curving stone terrace on which could be planted culinary and medicinal herbs. 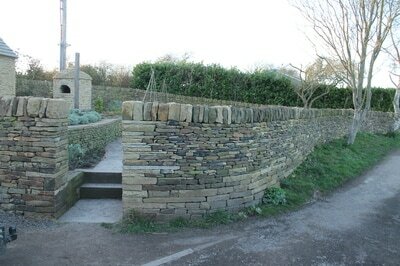 As we completed the retaining wall we planted up the long curving terrace bed. 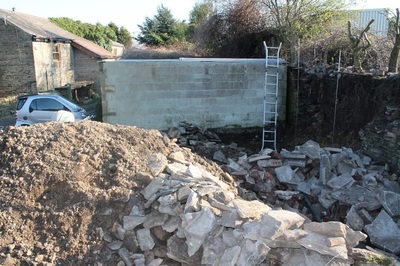 The main staircase was tied into the retaining wall by building two wall ends on either side which returned into the steps. 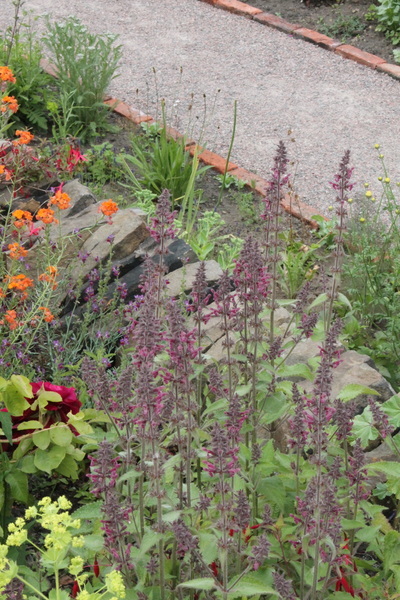 In the corner of the garden we also created a separate raised area that became a small Elizabethan style 'knot garden', a herb garden defined by rows of low box hedging. 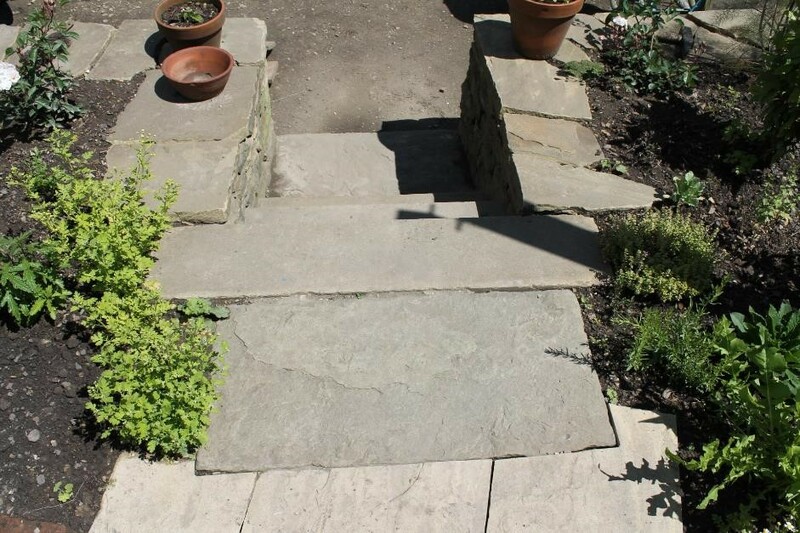 We brought in reclaimed York flags in order to create a large patio area and used three large slabs to make a seating area among the flower beds. 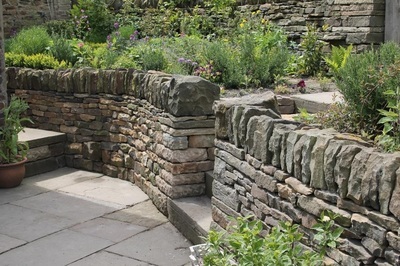 Once the shrubs and flowers grew up it softened the stonework and created a multi-level vibrant garden. On the other side of the track on a raised aspect, there had been a vegetable garden encircled with derelict dry stone walls. 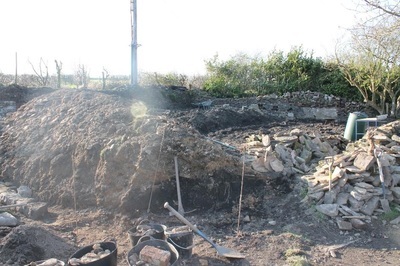 The lay of the garden was uneven and on an uphill gradient that made gardening slightly awkward. 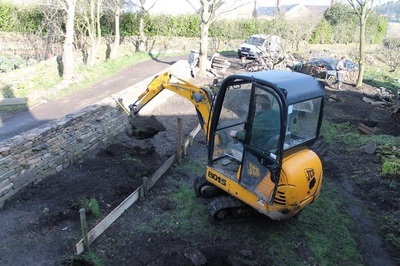 The plan was to create a parking area and build a large curtain wall that would obscure vehicles from view when in the garden. We then wanted to create a tiered garden with a curving retaining wall that would mirror the lower garden. We began by hiring a mini-digger and excavating the area for parking as well as stripping out a collapsed stone building that was in the garden. 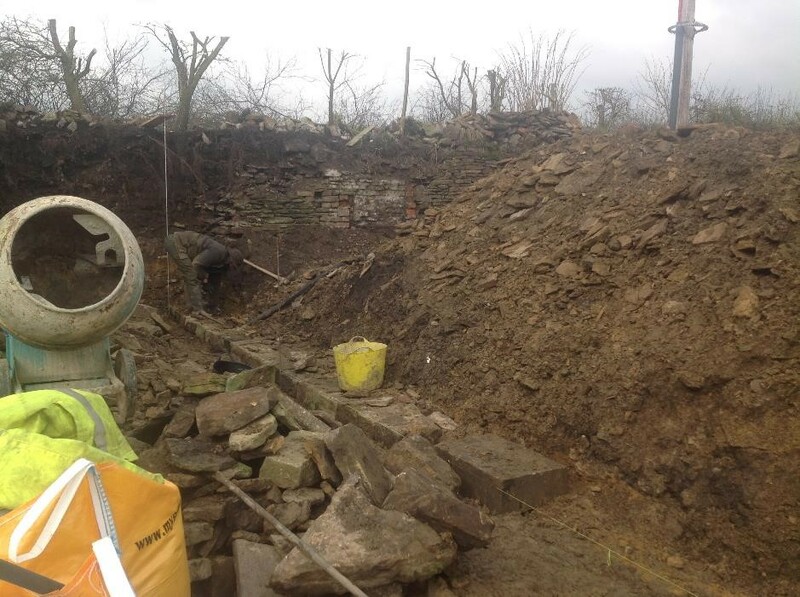 Again it was necessary to completely start over with the garden in order to create a new landscape layout. 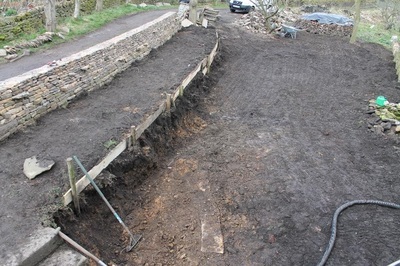 After excavating the car parking area we started to build the large semi-retaining wall that also absorbed all the stone that was dug out the ground during landscaping with the digger. 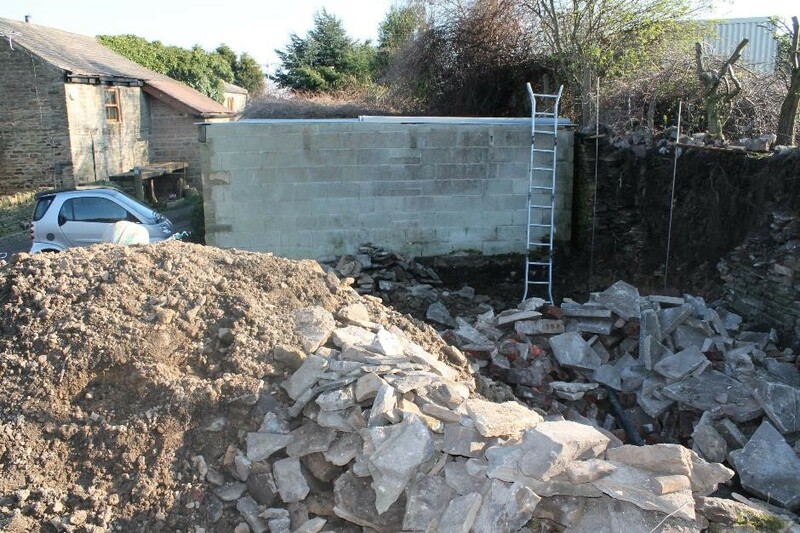 This wall linked into a large retaining embankment that was around 10 feet in height. 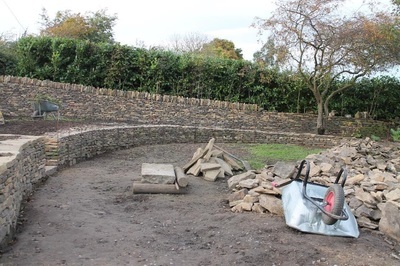 We then moved on to completing the boundary walls encircling the garden and the retaining wall that creates the large upper tier in the garden. 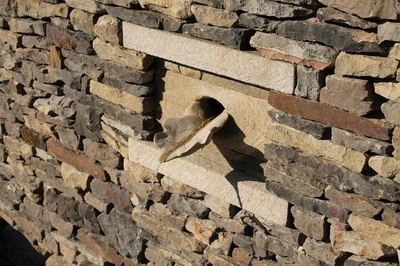 We carved a rainwater spout out of a single piece of pale Portland limestone, which is ideal for carving. This is the opening for rainwater to drip into a tank from a pipe that is built into the wall collecting rainwater from a garage roof. The stone was carved in the likeness of a oak leaf and then built dry into the rear boundary wall. 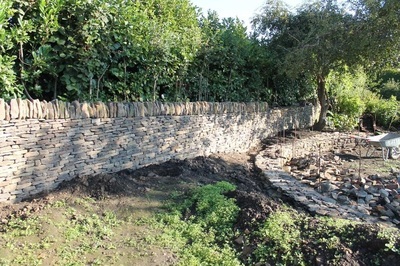 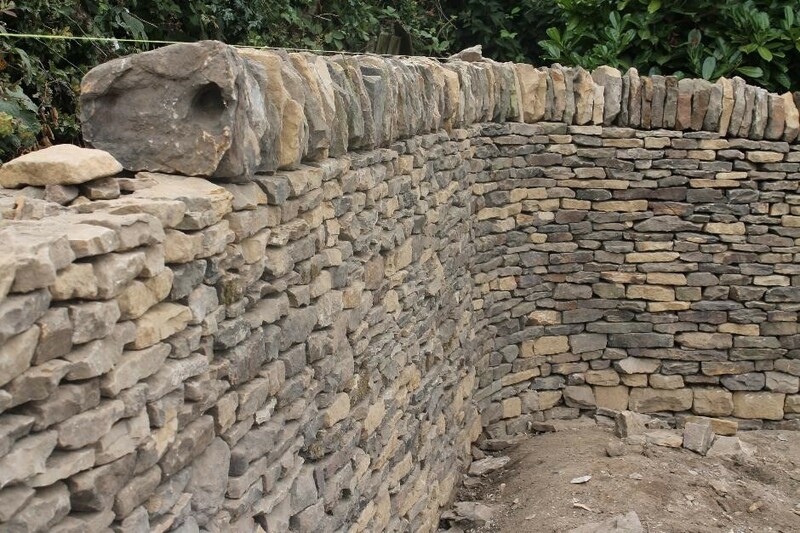 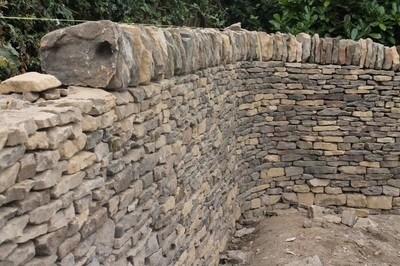 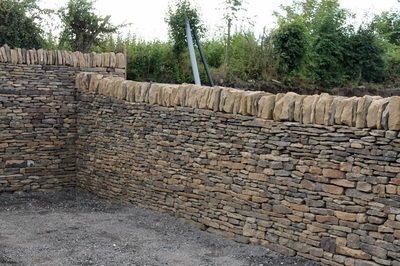 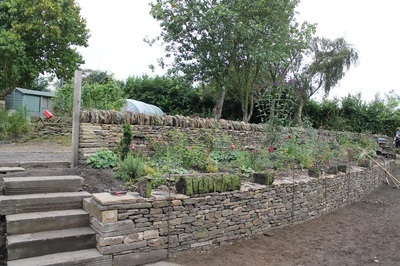 We built a low wall to retain the upper bank of the vegetable garden and finished off the top with large flat pieces of a hard sandstone from West Yorkshire. 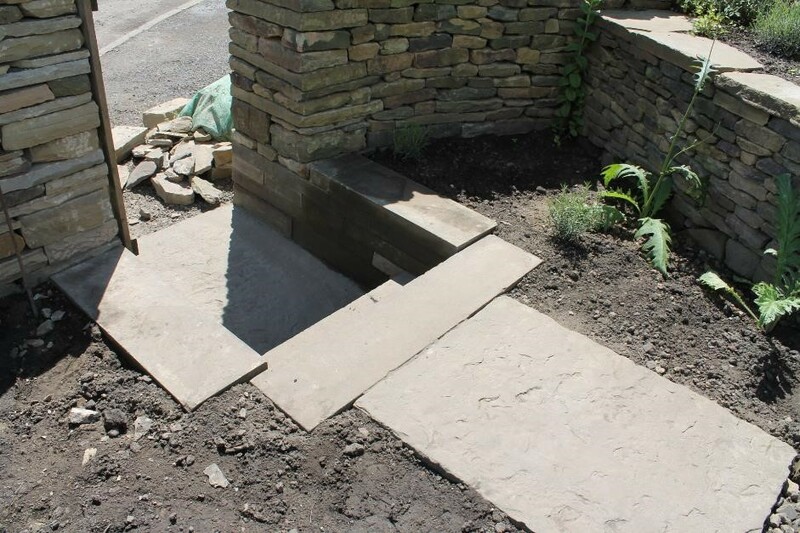 This flat cope is substantial enough if the pieces are heavy enough to give a good downward pressure without needing to be mortared in position. 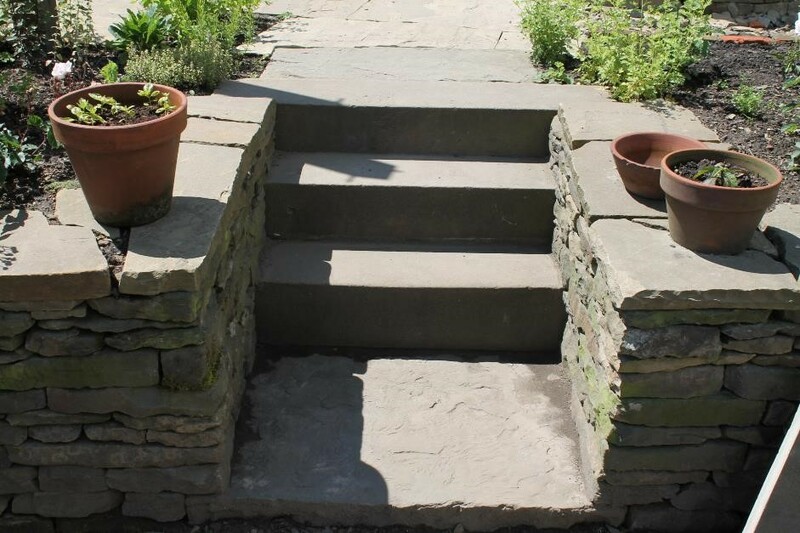 We brought in some thick reclaimed blocks to form two staircases in the garden. 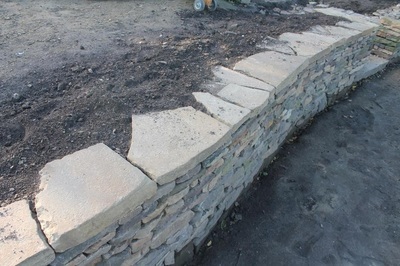 We had also managed to find four large riven York stone slabs to form top and bottom treads for both staircases. 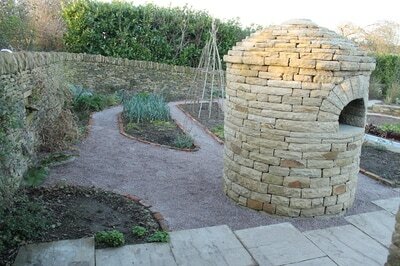 The two stone staircases nicely mirrored the staircase to the lower garden. We laid paths and beds using reclaimed bricks that would suit the feel of the garden and not contrast sharply with the stone. 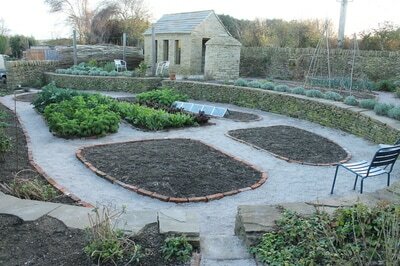 The beds are laid out in quite a formal pattern with wide paths between them. The idea behind the planting is a mix between herbal and edible flowers and rows of vegetables and salads based on French potager gardening. 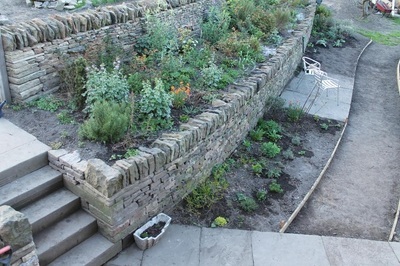 A large part of the area in the upper terrace has a large patio of quarried riven flags from West Yorkshire surrounded by an apothecary garden including thyme, mint, rosemary, borage and lavender. 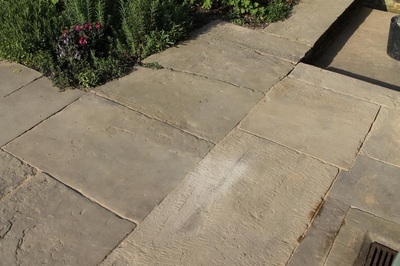 Next to this patio is also a large stone pizza oven (detailed pictures in the features section of this website) that is a pleasant masonry feature in the garden and is also great for summer garden parties. We also started work on the large boundary wall that completes the boundary of the garden. 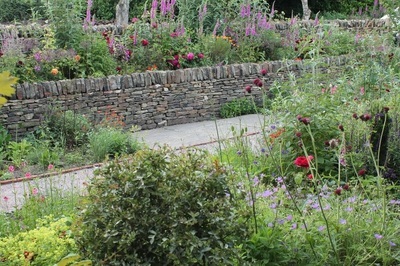 This is an S-shape and elegantly wends its way around a rowan and birch tree and then follows the track.